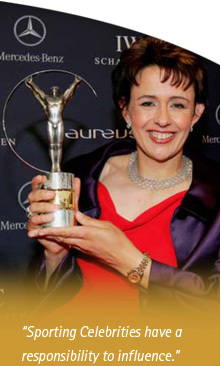 Dame Tanni is a member of the Laureus World Sports Academy. The academy is a group of 44 sporting legends, who are invited to become members and who then nominate their peers for membership. The Laureus World Sports Academy is backed by founding Patrons: DaimlerChrysler and Richemont. The Founding Patrons underwrite and stage the Laureus World Sports Awards and provide core funding for the Laureus Sport for Good Foundation. Photo: RAMALLAH, October 26, 2008 – "Aim High" Dame Tanni Grey-Thompson and Laureus Chairman, Edwin Moses, pose with Palestinian refugees basketball players at a west bank visit to encourage The Power of Sport to change lives.